CLEVELAND, OH - OCTOBER 30: (L-R) TV analysts Reggie Miller, Charles Barkley and Marv Albert speak before a game between the Cleveland Cavaliers and the New York Knicks at Quicken Loans Arena on October 30, 2014 in Cleveland, Ohio. 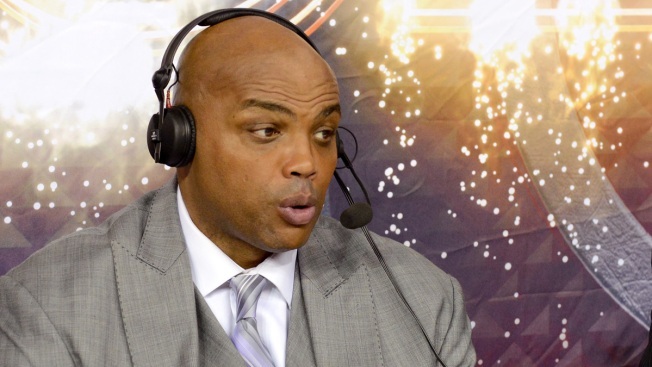 Outspoken former professional basketball player Charles Barkley says instead of kicking Dallas Cowboys defensive end Greg Hardy out of the NFL, shouldn't we do everything we can to prevent domestic violence from happening again? And, according to Barkley, that means helping, not punishing, Greg Hardy. Hardy, on Saturday, took to Twitter to share regret for his past behavior saying: "Just had to say I express my regret 4 what happened in past and I'm Dedicated to being the best person & teammate that I can be. But mostly I am Grateful 4 the opportunity to play in NFL." Hardy, of course, has been accused of beating his ex-girlfriend in an assault in May 2014 when he played for the Carolina Panthers. A judge believed Hardy to be guilty, but during an appeal he and his ex-girlfriend settled out of court, she didn't testify and the charges were dropped. Hardy's record was expunged on Thursday. A day later, Deadspin published photos reportedly showing bruising on Hardy’s ex-girlfriend’s taken after the alleged incident. "I believe that domestic violence is 100 percent wrong. You should never hit a woman. But I also believe Greg Hardy needs a chance to get better—not as a football player; as a human being," Barkley wrote on BleacherReport.com. "He needs psychological help so he can be a better man. I hope Greg Hardy doesn't let me down, but more importantly, I hope he doesn't let himself down. He needs to be willing to admit the problem and be accepting of treatment." Barkley's missive mentioned other athletes who sought, and recieved, help for mental illness.Barkley added more needs to be done to address the problem rather than simply punishing someone after the fact. "I know what I believe. And I believe Greg Hardy deserves a chance -- to get better," Barkley wrote. Barkley's op-ed on the Hardy issue comes the same day Texas Rep. Michael C. Burgess called for Hardy to be fired from not only the Dallas Cowboys, but from the NFL. Burgess said Hardy's employment by such an elite organization sends the wrong message on domestic violence and those who would victimize others. “These photos are disturbing. I want the NFL and the Players Association to explain why it’s acceptable for Greg Hardy to still be playing. The Dallas Cowboys pride themselves on being ‘America’s Team,’ and they have an obligation to their fans, players, and families to conduct themselves with the highest professional integrity," Burgess said in a prepared statement. "The employment of this individual is sending the absolute wrong message on domestic violence." Burgess hoped to discuss Hardy's future, and that of any NFL athlete accused of domestic violence, with the league. "While we did not have access to the photos that became public today, we were and are aware of the serious nature of this incident. We as an organization take very this seriously. We do not condone domestic violence. We entered into the agreement with Greg fully understanding that there would be scrutiny and criticism. We have given Greg a second chance. He is a member of our team and someone who is grateful for the opportunity he has been given to move forward with his life and his career." Read Barkley's entire column here.